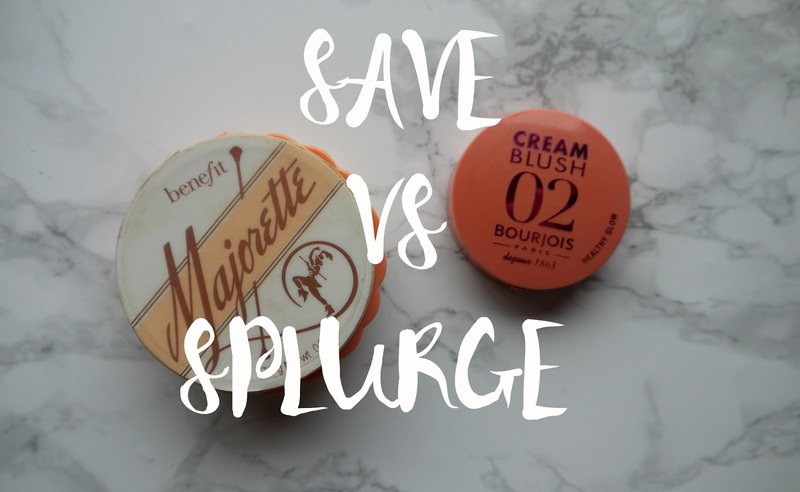 Cream blushers Benefit Majorette and Bourjois cream blush in 02 Healthy glow. Bourjois cream blush in 02 Healthy glow £7.99 - This cute little pot is so handy, it can fit anywhere! It is the only cream to powder blush I know of in the high street offering unless I'm missing something? 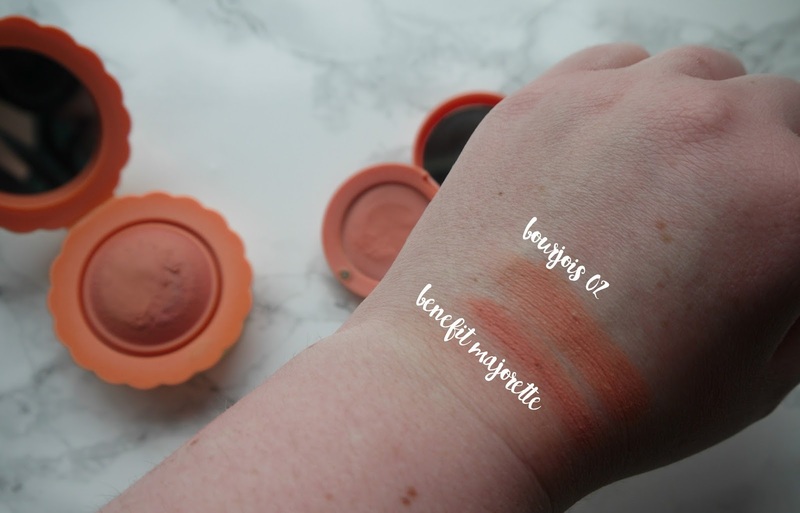 It gives you such a 'healthy glow' hence the name of the shade, I love it, perfect for spring the coral touch on your cheeks really makes it brighten up that area. Its lasts a good few hours and goes on with a velvet touch to the skin and dries instantly to a powder like finish. 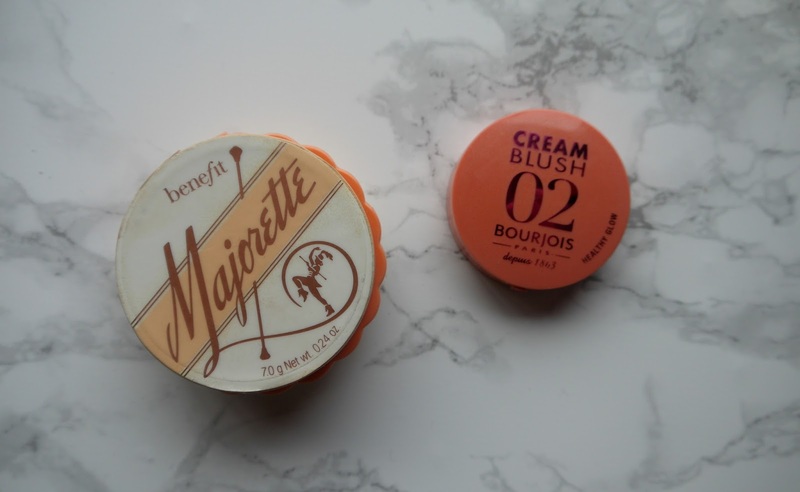 Benefit cream blush Majorette £23.50 - How pretty is this packaging? It smells amazing too! I adore this blusher and the colours between both is so similar with a very similar finish also, this cream blusher also dries to a powder finish, feels velvet on the skin like the bourjois one but has that more luxe feel to it. Not only can you wear this as a subtle coral colour to your cheeks you can use this as a primer for your favourite powder blush to keep it lasting longer and make the colour pop more. You can apply this with your fingers or your favourite blush brush, I like stippling brushes to just dab on to the apples of my cheeks. Consistency both the same and the colour pay of id also very very similar. My winner of today's topic is Benefit, it has the luxury feel to it, the packaging is adorable and it can be used for both a primer or a blusher alone, smells amazing and can last me all through out the day, the perfect pick me up blush to look fresh and pretty. If you don't want to splash out on the more expensive blusher though the Borjois one is just as good and less than half the price great to fit it anywhere in your handbag too. 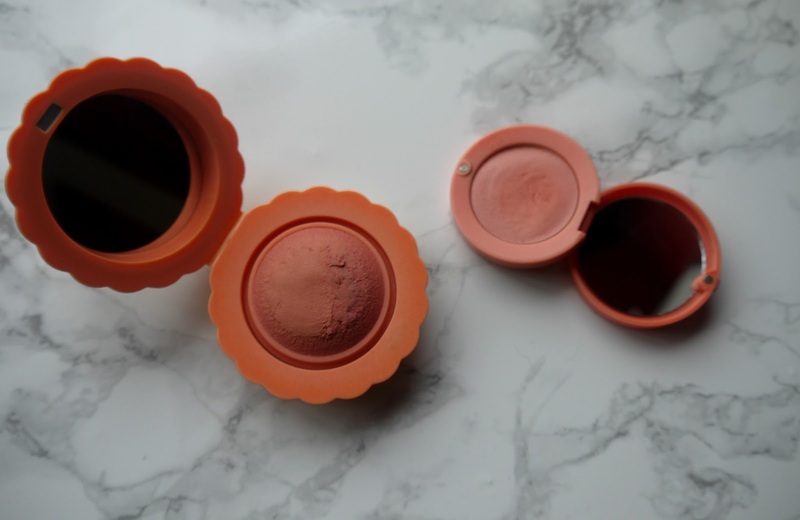 Do you use any of these blushers? I would love to hear your favourite cream blushers in the comments below so I can check them out. I've tried the benefit one and I do like it! The price point does pain me though, definitely need to try some of the Bourjois ones next!